Windows 10 Anniversary Update slow internet speed. If you suspect that your internet should be faster than it is, then it might still be worth investigating the potential cause. The problem, if it exists, could be down to a feature called Window Auto-Tuning which Microsoft first introduced in Windows Vista and has included in every version of its operating system since, including Windows 10. Go to Start, type cmd, right-click the Command Prompt entry and select Run as administrator. Look for Receive Windows Auto-Tuning Level. If it says Normal that means it’s running. You can try disabling it to see if it’s the cause of the problems with your internet speed. 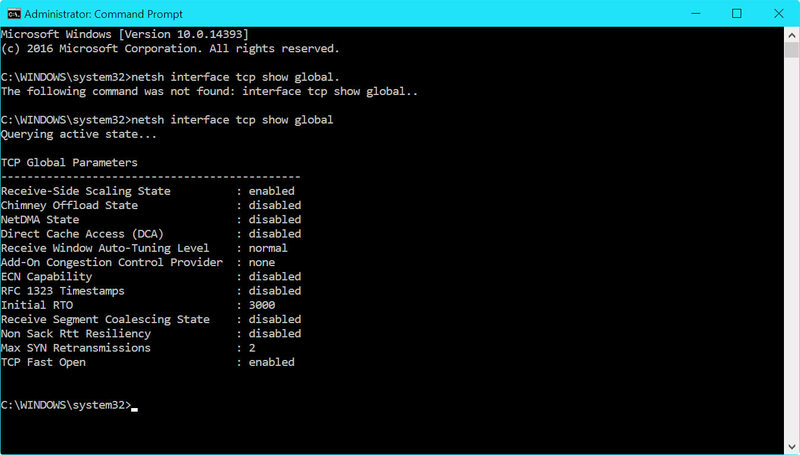 To do this type netsh int tcp set global autotuninglevel=disabled into the command prompt and hit enter. Once it disabled, try using your internet connection again and see if that’s fixed the problem. If it hasn’t, or things are actually worse, then you should re-enable it. In the command prompt, type netsh int tcp set global autotuninglevel=normal and hit enter.